Last Fall I noticed eBay auctions for some SE-8 Conclave pins that included the most amazing hatpin pictures I have ever seen. I immediately emailed the seller (Daniel Graham) and asked permission to use his pictures which are far superior to the ones I have online (most of which I did myself). He not only gave his permission, but also sent stellar pictures of many other pins in his collection for inclusion on my web site. 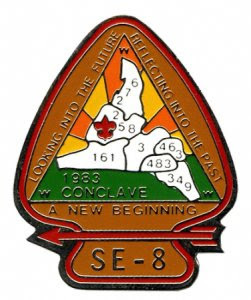 Above you'll see an example of his work - a picture of the hatpin from the 1983 SE-8 Conclave hosted by Shenandoah Lodge. In addition to the one above you'll soon see pictures of the hatpins from the 1984-1988 Conclaves linked on the SE-8 Emblems page. Awhile back my friend Larry Johnson reviewed all the items on the SR7-SR7A Emblems page and discovered more than a few items not listed that he has in his collection, so he scanned pictures and sent them along for me to add them to the web site. I finally found some time to prepare and upload the pictures and add links to the listings. Several are pictures of participant conclave patches (typically these are identical to the pocket patch with the addition of a button loop to enable it to be worn immediately), or variations like a staff version that has a different color border than the standard pocket patch. Also added are pictures of some Vigil Rededication tokens, as well as the unique Passport Pin pictured above from the 2008 Conclave hosted by Shenandoah Lodge 258. Larry provided me with pictures of many more items Conclave items that I will be adding soon. 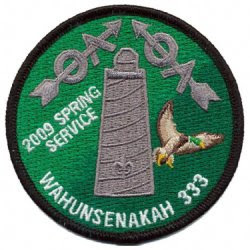 Larry Johnson returned from the Wahunsenakah Lodge 2009 Spring Service weekend and sent along a picture of the patch issued for the event which was formerly known as the Spring Ordeal. The Lodge reportedly renamed the event to better reflect the full extent of activities that occur besides the Ordeal. The patch follows the same design as the others in the 2009 series, with the only difference being the name of the event and the color of the background. Also issued at the event were the Lodge flaps earned through service at the Lodge's Beaver Days held in late 2008 and early 2009 to prepare Bayport Scout Reservation for the 2009 SR-7A Conclave. A minimum of 14 hours of service were required to earn the Beaver Day flap.